Ash, soot, creosote, water and acid, this all comes from the burning of hydrocarbons, wood, coal, oil and gas. Each of the fuels produce different products and some of the same depending on how they are burned and at what efficiency they are burned. Burning oil or gas produces a very wet exhaust that when condensed can rot the inside of the chimney like turning a hose onto a sand castle, it just washes away. Burning wood or coal adds a whole new dimension to the word mess. Coal is very corrosive, more so than oil as is contains more sulfur. Wood produces soot and ash that can cote the inside if the flue reducing the efficiency of the draft. When burned low and slow in a wood stove or in a slow smoky fire place it can produce creosote. This is actually tar vapor condensing into a liquid and then hardening into a flammable solid. A special thank you to a great bunch of students from Delaware, (with a very special thanks to Samantha! ) who sent us this invaluable information on Carbon Monoxide Poisoning. With the cold weather coming, people will soon be turning on furnaces and space heaters, its important to know all you can about carbon monoxide poisoning. Please see the "Portable Guide to Carbon Monoxide Poisoning" put together by www.air-n-water.com. This is a terrific resource containing all the information you could ever need regarding carbon monoxide. Thanks Samantha & Ashley and all the Delaware students for the info! Heated wood releases hydrocarbon gases. When these get hot enough (about 1100 degrees F) they mix with air and catch fire. When hearth or wood stove fires smolder, unburned gases condense and deposit on the stove pipes and the flue as runny acids and liquid tars that harden into creosote. Both a cool flue and steam from green or wet wood create this condensation. a deposit that looks like burnt marshmallows. "Crumbling and cracking mortar; Balls of flaming creosote shoot out of the chimney top onto the roof; Clay-tile fluliners crack open; Stainless steel liners warp, buckle and separate at the seams; Masonry in the chimney expands with such force that sections of the chimney can blow out; flames can spread to the structure or roof of the house even explode into the room". This type of creosote makes for the hottest burning fuel for a flue fire. The thicker the layer of creosote, the hotter the fire. The heat generated by this infernal can raise to ignition point, the temperature of wood structures on the other side of a chimney, so that it also starts to burn threatening the entire house. Wood doesn't necessarily need contact with fire in order to ignite. It just needs air, oxygen and enough heat. 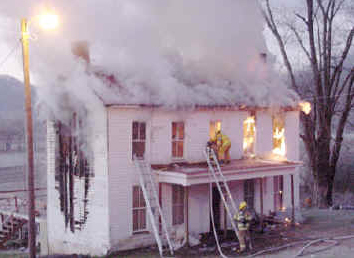 A house may survive the first chimney fire, but the intense heat has started pyrolyzing* nearby combustibles, thus lowering their ignition temperature. This makes the structure very vulnerable to a subsequent chimney fire. 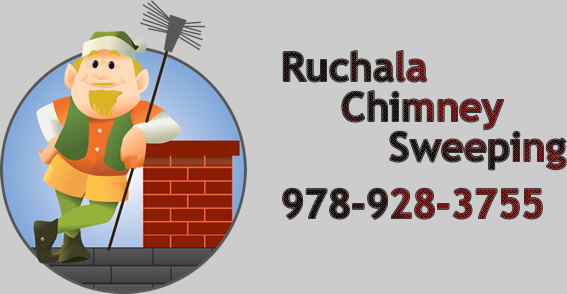 A damaged flueliner can no longer protect either the chimney or the house. And instead of being all burned out, creosote may instead be all puffed up to the point of partially or completely blocking the flue. Pyrolysis is chemical decomposition caused by heat. Severely pyrolyzed wood can ignite at only 2l2 degrees F, while it would normally have a catch-fire temperature of about 500 degrees F, before it had any exposure to intense heat. Build smaller, hotter fires that bum completely and produce less smoke. Never burn cardboard boxes, wrapping paper, trash or trees; these can spark a chimney fire. Every house needs at least one fire extinguisher, there are many web sites that will teach you how to choose (and to use correctly) a fire extinguisher. 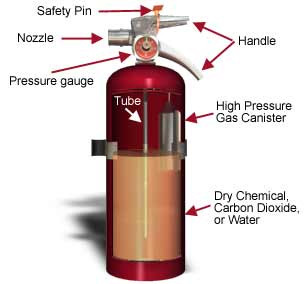 Please see our Services page for some helpful links on fire extinguisher and fire alarm safety. Please refer all comments regarding content or technical issues here.